Game play is quite simple. 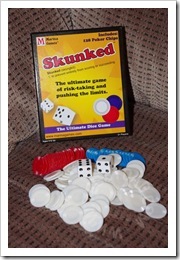 Each player rolls the dice and records their score. As you roll again and again, you add to your score until you either decide to stop or you roll a one. If you stop, that round’s total is added to your score. However, if you roll a one, then your score that round is reset to zero and you must put a chip in the pot. Beware of double-ones. That will reset your entire game’s score to zero. Just to add insult to injury, you’ll need to toss four chips in the pot. If a player reaches (or exceeds) 100, then the game turns into a high score competition. 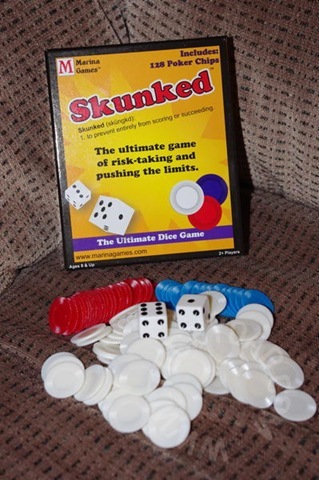 Each player must match or top the high score on their next turn or they are eliminated. The last player standing gets all the chips in the pot. The player with the most chips after three games wins. This is definitely a game that I would play again. In fact, I might try playing this with NHL next time. (JSL could easily roll the dice but is too young to understand the scoring portion.) In fact, I think the fun factor of this game would only increase the more players you add. who provided the complimentary product for review in exchange for my honest opinions.